The MT6 areas are the most commonly used. 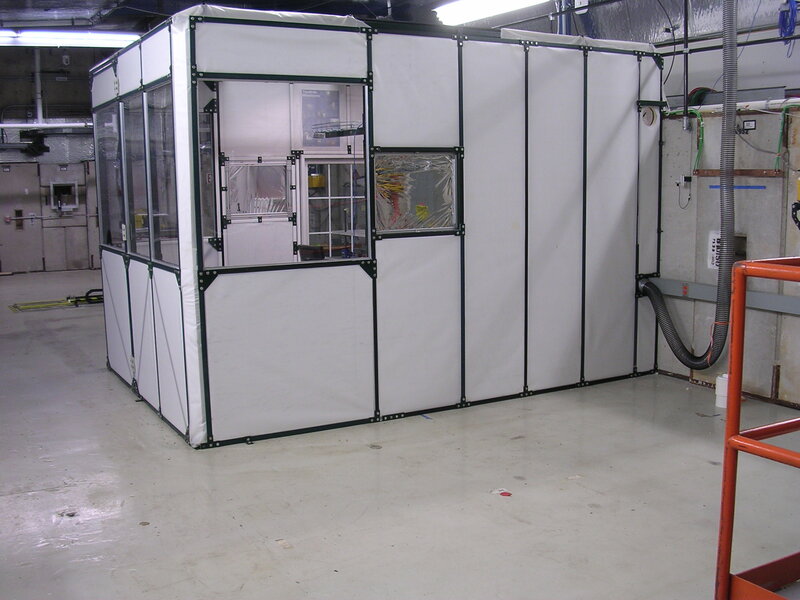 They have all of the features mentioned in facility Infrastructure, including flammable gas and all of the Instrumentation available to them. 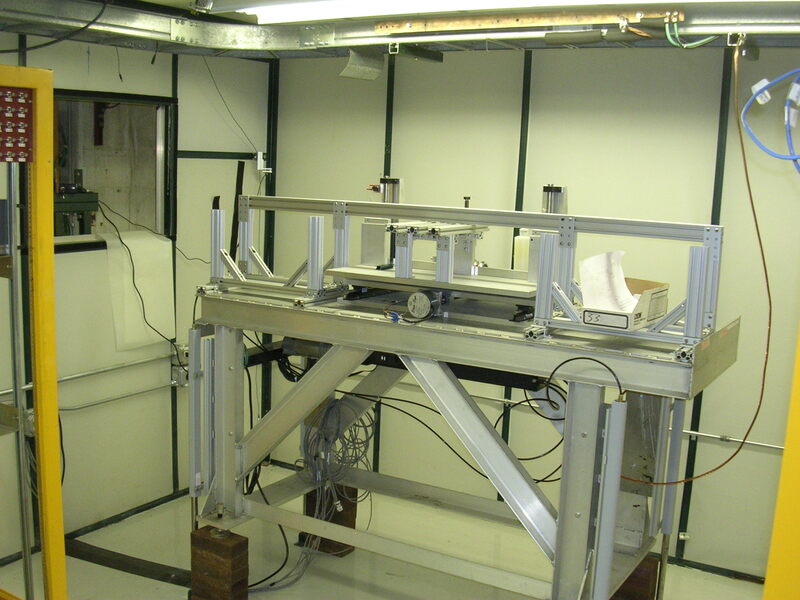 The primary beam consists of high-energy protons (120 GeV) at moderate intensities (~1-300 kHz). This beam can also be targeted to create secondary particle beams of energies down to about 1 GeV, consisting of pions, muons, and/or electrons. The beam has a 0.3° rise to it. Experiments in these areas typically turn over on a weekly (1-4 weeks) basis. 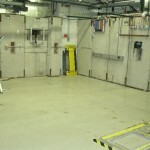 This area is for small, thin experiments, ideal for gas chambers. 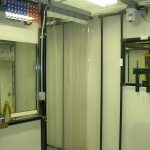 Experiments have access to patch panels, inert and flammable gases, and can be viewed from camera 01 or 02. 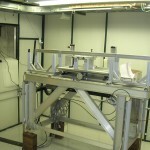 Experiments can use the laser system to accurately set up their apparatus, and access is easily available. Beam is approximately 65 inches from the floor. Muons are available in the area. This is the most commonly used area. 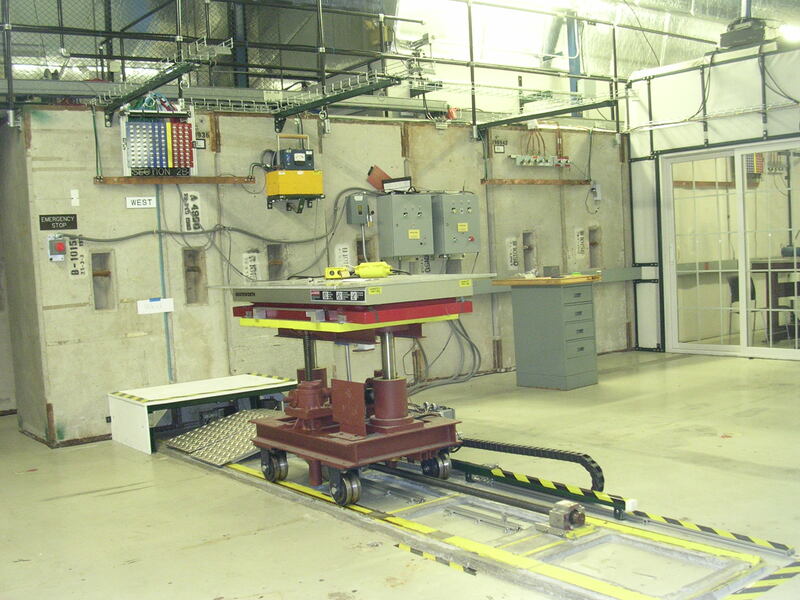 Experiments typically set up on the movable die cart, and have access to patch panels, inert and flammable gases, and can be easily viewed from camera 01 or 02. 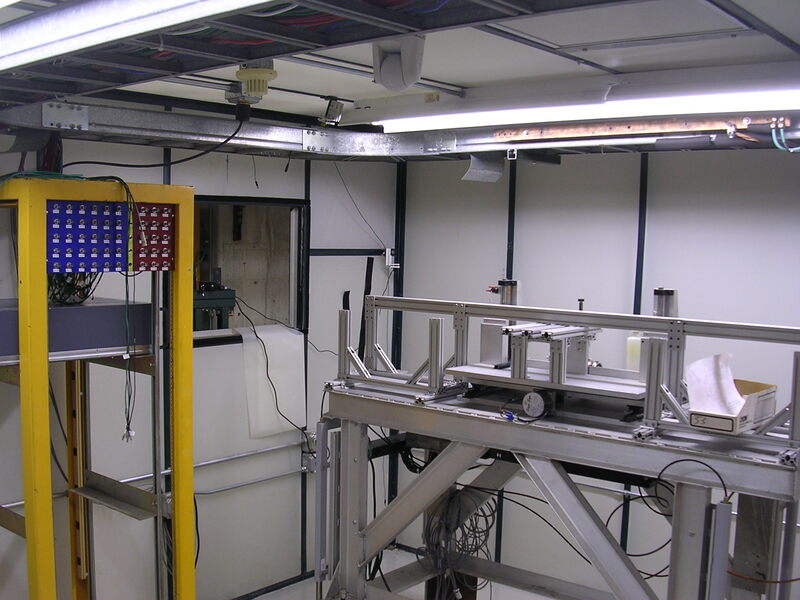 Experiments can use the laser system to accurately set-up their apparatus, and access is easily available. Beam is approximately 65 5/8 inches from the floor. Muons are available in the area. 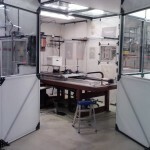 This area is ideal for experiments which are extremely sensitive to temperature. 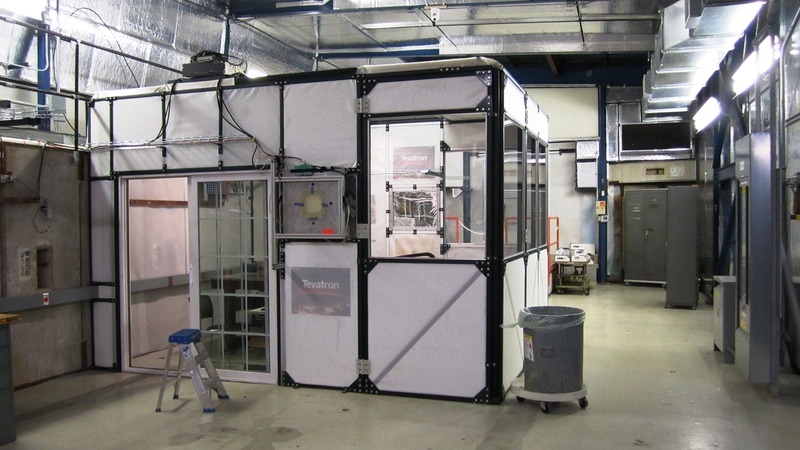 Inside the hut, an additional AC unit can be added to maintain temperatures down to 68°F, depending on heat output of user’s devices. 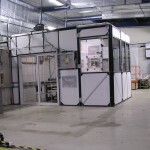 Inside the hut, users can set up on a remotely controlled motion table, or the table can be removed, to fit large (multi-ton) detectors. This area also has patch panels, inert gas, and laser system alignment. (No flammables inside the hut.) Users may view their apparatus using the 05 camera. 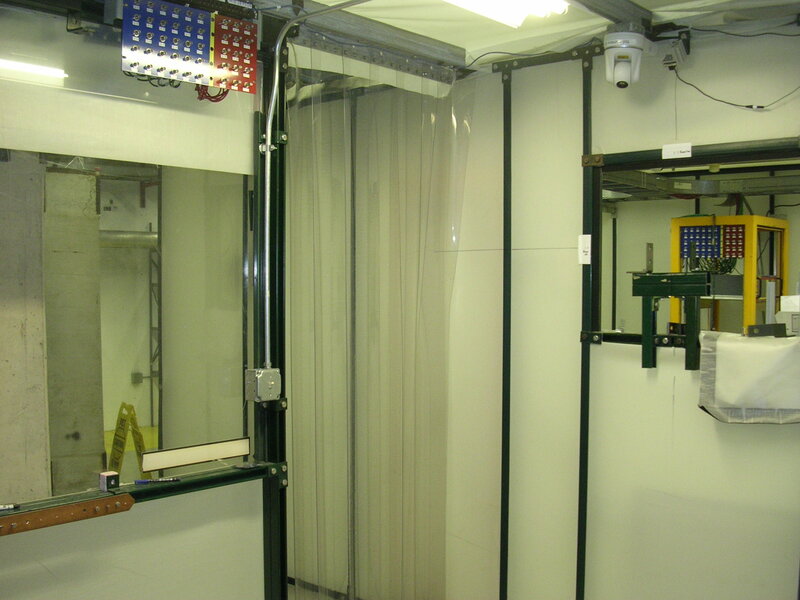 The hut is 9.5 feet in length along the beam line, by 13.5 feet wide (beam line is 64 inches from the nearest wall) with a total height of 9 feet. Beam height is approximately 66 5/8 inches from the floor. Muons are available in the area. 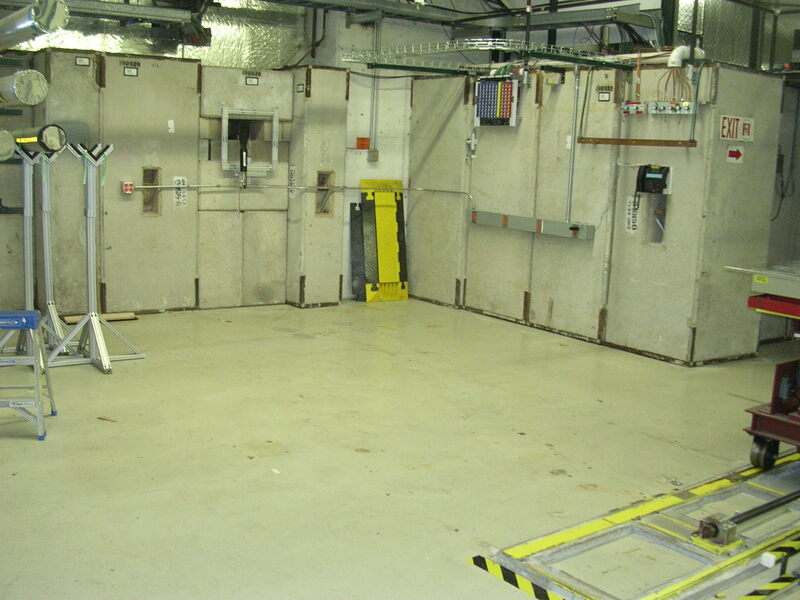 This area is ideal for large (multi-ton) experiments, and thick detectors like calorimeters. The area is elevated on concrete shielding blocks to account for the 3 degee beam pitch. 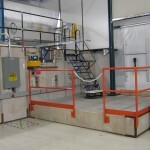 This area is located directly below an overhead hatch, so equipment can easily be lowered in by crane. The Hatch opening dimensions over the 2-D area is roughly 9 1/2 foot x 9 1/2 foot, and with some effort can increase to 9 1/2foot x 14 1/2foot. This area has patch panels, inert gas and laser system alignment. It is viewable from camera 01. 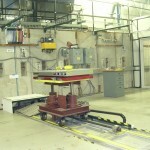 In front of the concrete blocks, beam height is approximately 67 1/8 inches from the floor. Muons are available in the area. 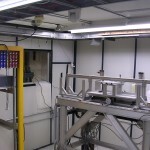 This is the most upstream experiment area in the MTest Beamline and is best for small, thin experiments. The Silicon strip telescope is located in this area, and users can place their device under test on a small platform, between the planes which can be remotely controlled. The area is enclosed within a herculte hut, for added cooling and to keep dust to a minimum. 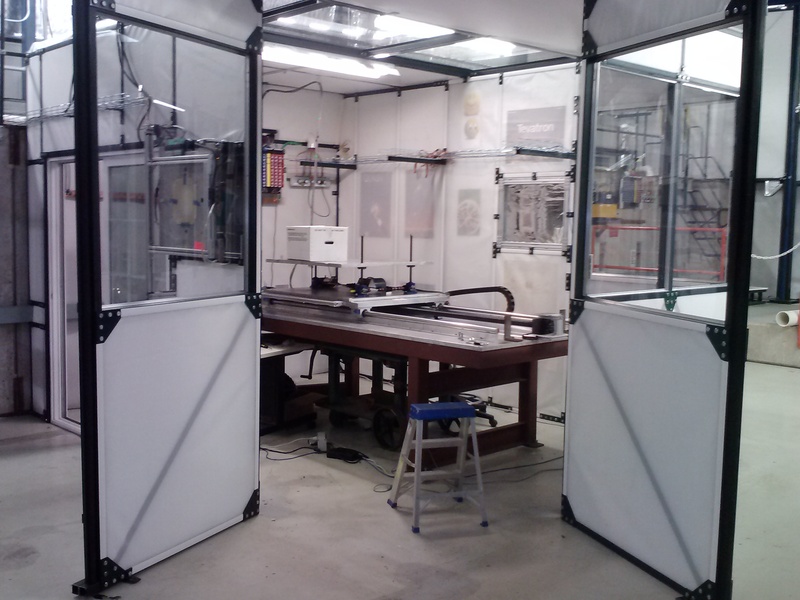 Experiments have access to patch panels and inert gas. (No flammables inside the hut). 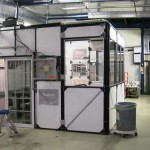 The apparatus can be viewed from camera 04. 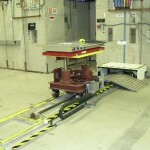 Experiments can use the laser system to accurately set-up their apparatus, and access is easily available from the Alcove control room. 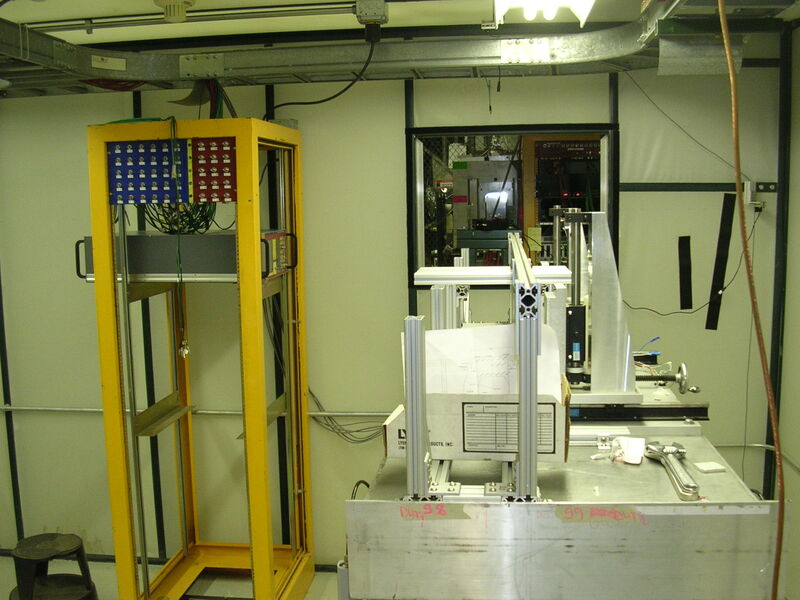 The hut is 12.5 feet along the beamline, by 14 feet wide (Beam is 4 feet from nearest wall), and 7.5 feet heigh. Beam is approximately 64.5 inches from the floor. 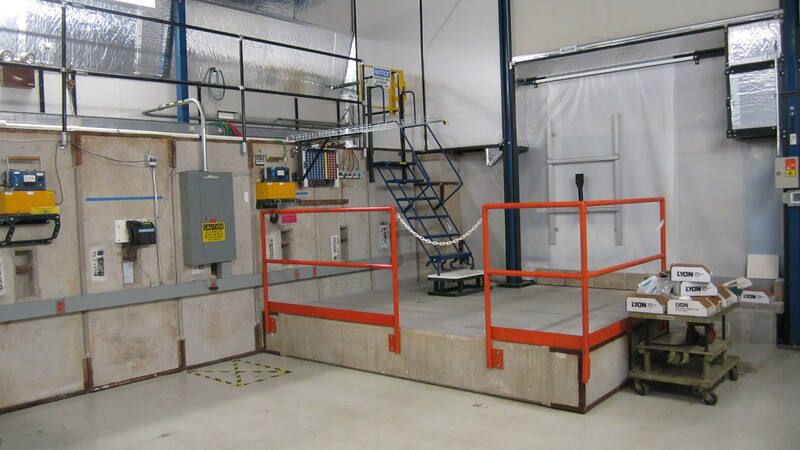 Muons are not available in this area, because it is in front of the beam stop. This area is best for small, thin experiments, and is located immediately downstream of the Silicon strip telescope. 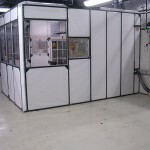 The area is enclosed within a hut, for added cooling and to keep dust to a minimum. 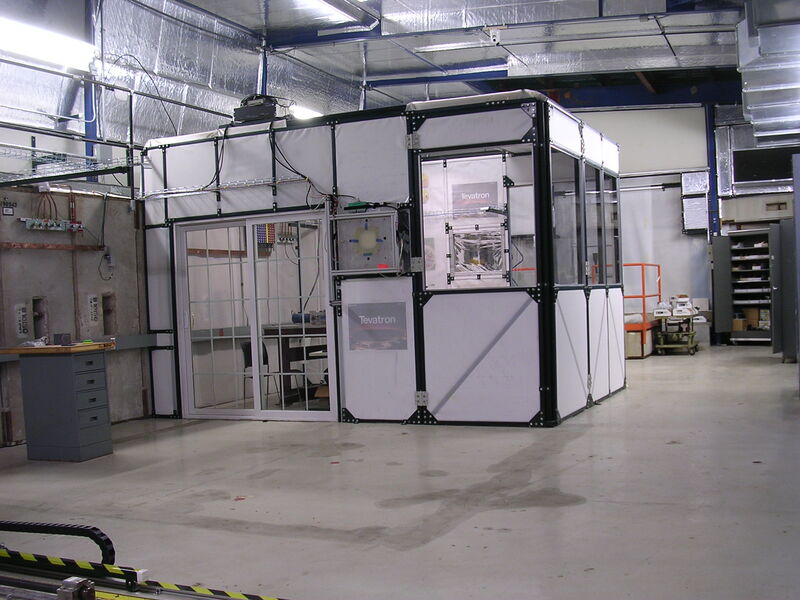 Experiments have access to patch panels and inert gas. (No flammables inside the hut.) The area can be viewed from camera 03. 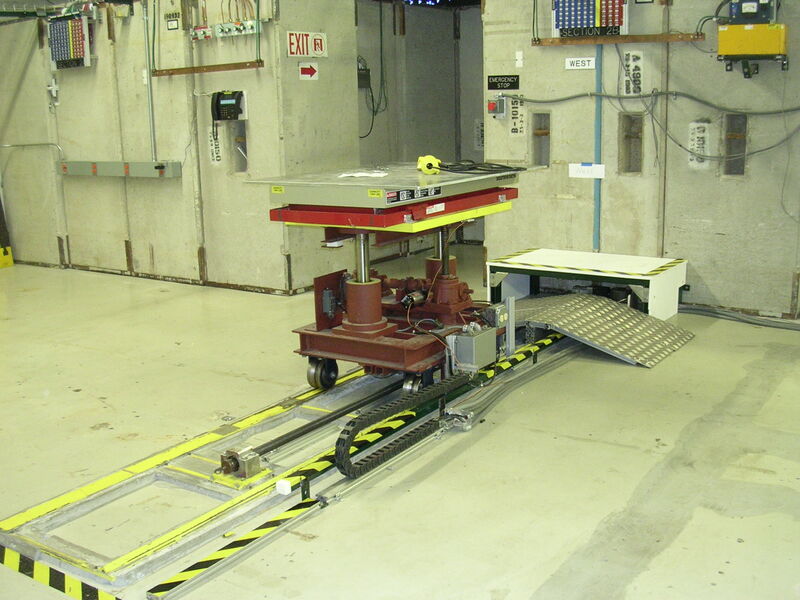 Experiments can use the laser system to accurately set-up their apparatus, and access is easily available from the Alcove control room. The hut is 9 feet in length along the beam line by 7.5 feet wide (beam line is 4.5 feet from nearest wall), with a total height of 7.5 feet. Beam is approximately 65 inches from the floor. 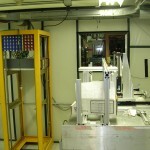 Muons are not available in this area, because it is in front of the beam stop.